Are you a military veteran in need of home care? The Aid & Attendance benefit may help reduce the cost of care. Many military veterans and their family are unaware of the Aid & Attendance benefits program for which they could be eligible. 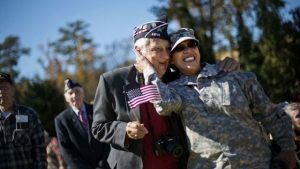 The Veterans Aid & Attendance Pension is a little-known existing benefit which helps reduce the cost of care for older veterans and their surviving spouses. Aid & Attendance is available to eligible veterans and spouses who require home care – including assistance with eating, bathing, and medication reminders – even if the assistance is not a direct result of a service-related injury. You require the aid of another person to perform personal functions required in everyday living, such as bathing, feeding, dressing and transferring; or you need help protecting yourself from the hazards of your daily environment – for example, if you have an increased risk for falls. Your eyesight is limited to a corrected 5/200 visual acuity or less in both eyes, or concentric contraction of the visual field to 5 degrees or less. If the veteran entered active duty after September 7, 1980, generally he/she must have served at least 24 months or the full period for which called or ordered to active duty. However, there are exceptions to this rule. You may apply for Aid and Attendance or Housebound benefits by writing to the Pension Management Center (PMC) that serves your state. At FirstLight we are proud to serve many veteran families with personal and customized care. If you are a family caregiver and need assistance with your aging veteran or their spouse, such as getting them to and from medical appointments, personal care, or care around the home, we can help. FirstLight offers many Veteran Care Services to support you.